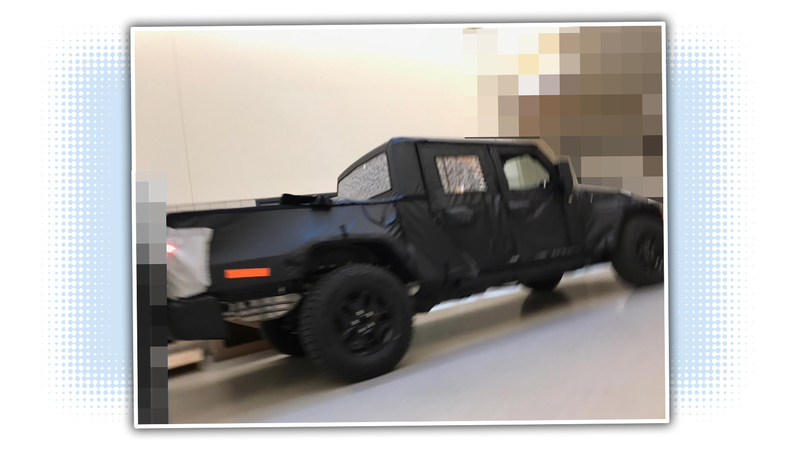 We’ve seen pictures of the disguised Jeep Wrangler Pickup before, but it’s an exciting thing, so I’m happy to show more leaked pictures of it when we get them. This picture is from inside an FCA facility, which is why I’ve obscured some of the background around the Jeep truck. So far we’ve only seen four-door crew-cab versions of the pickup. I’d like to see a smaller, two-door, single-cab version, but it’s not clear if that’s in the cards. So far we’ve just been calling it a Wrangler Pickup, though I’m wondering/hoping that they’ll decide to go with the old Jeep pickup name, the Scrambler. The idea that it will be a Scrambler has been speculated about a great deal online, but so far we’ve not had any official confirmation. Also, a stripe kit like that would be a very, very good idea. Maybe that wood slat-side thing in the back, too.